Located just south of Dubuque along the Mississippi River, this approximately 20-mile trail system offers a wealth of opportunities for recreation, environmental education, human history interpretation, and wildlife observation. Location: Mines of Spain State Recreation Area Trails System, South of Dubuque at Mines of Spain State Recreation Area. The trail system at the Mines of Spain Recreation Area includes eleven trails covering approximately 20 miles. The trails include the Lead Mine/Pine Chapel, Mesquakie, Calcite, Catfish, Julien Dubuque, Horseshoe Bluff, Fox/Sauk, Prairie Ridge, Cedar Ridge, Cattesse and Eagle Scout. These trails are all interconnected creating one long continuous trail system with loops and connectors. Main features found along the trail system include remnants of a lead mine, pit mine, Pine Chapel, 1880 Junkermann Farm site, Indian Rock Shelters, Indian Mounds, Native Tall Grass Prairies, Upland forests with 200-300 year old oak trees. Other natural resources include 3 miles of Mississippi River Shoreline with views of the river valley and park at several trail locations. White birches, river birch, a small wetland with floating bridges, an old quarry to illustrate the geology of the area are just some of the natural features that the trails pass through. Interpretive signs are found along several of the trail routes to illustrate the cultural histories and natural resources of the area. 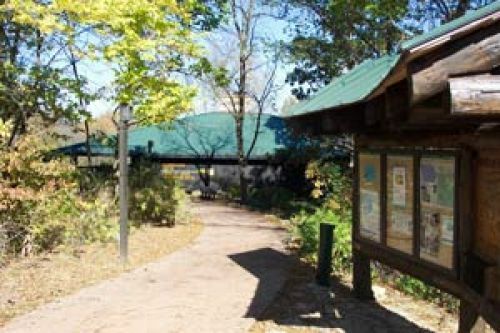 The park trails connect to Heritage Bike/Hike Trail and the Mississippi River Bike Trail. Julien Dubuque Monument and the Mississippi River.